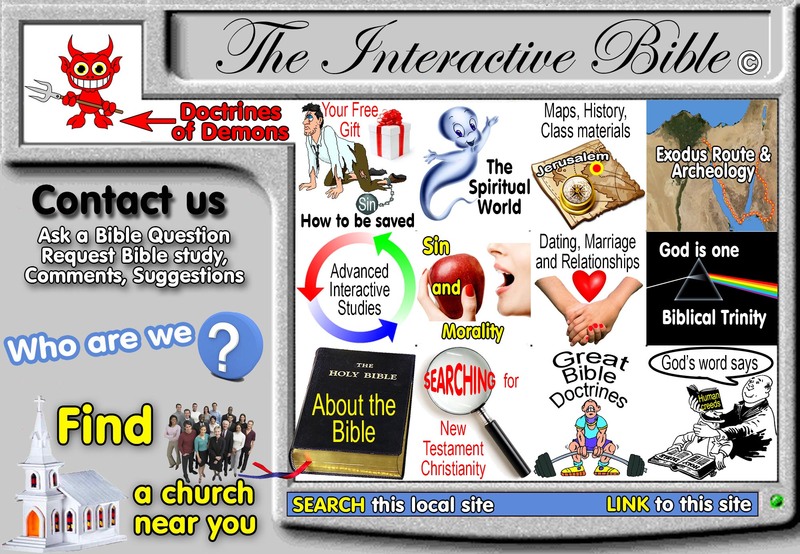 Interactive Bible study series lessons where you learn Bible truths while on line for yourself. Anyone can understand what the Bible says. It is fun!!! The Bible is God's Inspired Book! Do you really believe the Bible is Inspired? Do you know what your church teaches: Official teachings of almost every church. Sin and Morality How God expects you to live to get to heaven. Searching for New Testament Christianity Seek and you will find! Family Life Marriage, parenting, teens, dating, loneliness, low-self esteem etc. How to Be Saved You need the blood of Christ! Here is how to apply it to your soul! Sabbath Keepers Refuted An defense of why Christians worship on Sunday and not Saturday. For Jehovah's Witness New Converts Information every new Jehovah's Witness should know about his new religion. Evolution vs 6 day creation When God created the earth in 6 days He was taking His time! The Roman Catholic church examined Is the Roman Catholic church the original one true church? Mormonism Exposed Are the Book of Mormon and the golden Nephi plates from God or man? Calvinism refuted The famous 5 point T-U-L-I-P doctrinal system refuted by scripture! 20th Century Tongues exposed Are modern day tongue speakers guided by divinity or self-delusion? Rapture and Pre-millenialism A system that teaches our God couldn't make it happen the first time! Lies of the devil: Doctrine doesn't matter Tares among the wheat! Archeology: Digging up Bible stories! The Exodus Route Discovered and More! Ask a Bible question??? Get a Bible answer!